An introductory flight is your very first flying lesson with a flight instructor. You take the controls of the aircraft. 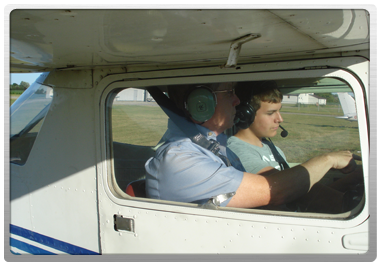 Your flight instructor will teach you how to fly the aircraft in straight and level flight. You will then learn how to pitch the nose up and down, and then how to roll right and left before always returning back to straight and level flight. This gives you the opportunity to experience the thrill of flying an aircraft for the first time. To book an introductory flight call 519 688 3968 or come in to the Tillsonburg Regional Airport and visit.